For many women, there’s always a point in their lives that they have considered trying new stuff like baking. Since women often love sweets more compared to the men, the tendency is they would wish to create them by themselves like cake and other baked goodies. In most cases, others would learn to bake first than cooking full meals. If you’re in this stage right this moment where you wish to start baking, it’s likely that you’ll be confused as to what to buy first. What is it basically that you require in order to begin doing your first simple cake? Should you consider many recipes, you’ll notice some kitchen tools that they often utilize and so these items will be mentioned to you. Below is a list of baking equipment and items you need to buy if you are really considering learning how to bake. This is the most critical and expensive piece of equipment that you’ll want to invest prior to starting to learning how to bake. This equipment makes use of direct heat for cooking and baking. It’s different from a microwave oven which uses microwave radiation to heat up food. When you observe, a lot of the dry ingredients as well as liquid are measured in cups. Because of this , you will need these measuring cup set for making your baking experience less difficult. These set usually comes along with ¼, 1/3, ½, and 1 cup. 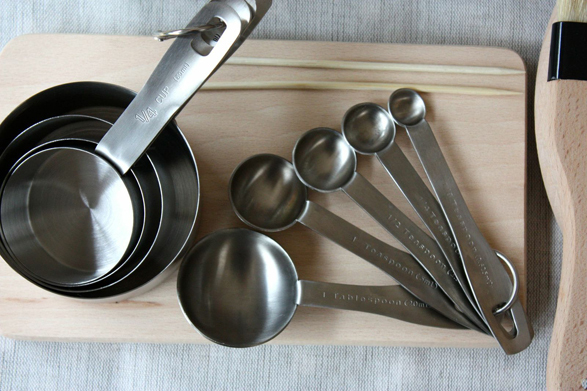 You can also purchase measuring spoons consisting of measurements such as ½ tsp, 1 tsp, 1/3 tbsp, ½ tbsp. and 1 tbsp. Of course, where else would you like to put your batter but in a baking pan. You could find pans in various shapes just like square, rectangle, heart, round, bear shape and more. In case you are just starting, choose the basic shapes like round and square. You will also find spring form pans that allow you to easily detach the bottom portion. These are suitable for soft textured cakes like cheesecakes. It is am extremely helpful tool if you don’t wish to exhaust your hand with mixing and wish to have consistency with what you’re baking. It is a time-saving equipment since you can easily mix your dough, frosting and many others by making use of it. You could freely select from stand mixers or hand mixers but these varies with functions and value. Consistency and accuracy is very important in baking. One simple error could destroy all. That’s why you also need a weighing scale to have the correct quantity of ingredients as suggested in the recipe. Weighing scales varies from digital to analog scales. You will likely need to invest about USD 300 to 500 to get the aforementioned fundamental baking equipment and tools. This small investment is worth it if you wish to acquire the skill of baking. You’ll experience the joy of baking after you make the very first cake successfully.